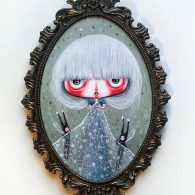 After attending the Academy of Art and Advertising NABA in Milan and working for several years as a graphic designer and illustrator, decided to devote herself to her true passion and work as a full time artist. 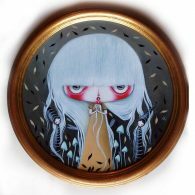 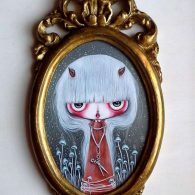 Silvia’s artworks, painted with acrylic on panel, tell of small girls with big eyes, motionless and ravenous. 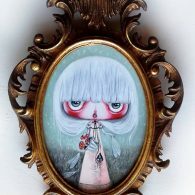 They invite the viewer into an emotional story, shyly described, a kind of diary, a bizarre dream in an enchanted garden. 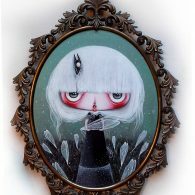 Silvia’s works can be best placed in the Pop Surrealist art movement and she exhibits in galleries both in Italy and abroad. 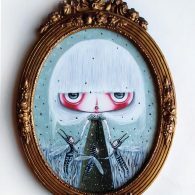 We are very pleased to have Silvia showing in Scotland for the first time with her Solo outing “Spirit of the Forest” in collaboration with Woodbee.